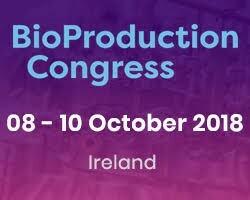 On the BioProduction conference in Dublin Fabian and Michael presented our contribution to make decision taking for the bioprocessing teams simpler, quicker and more robust based on our digital and automated tools. We had the privilege to also chair Smart Factories track and see a vivid interest of industry to step into this direction. Despite different priorities in the selection and application areas of such smart tools, it was evident that now is the moment to start advancing in this direction. 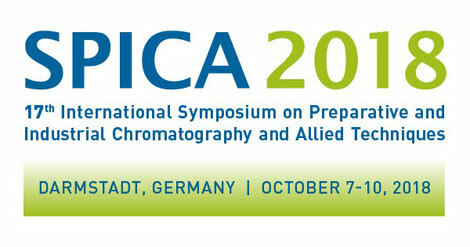 SPICA is one of the most prestigious conferences on industrial chromatography. Alessandro was invited as speaker and chairman to share our vision on the impact smart model-based digital solutions can have also in this sector of bioprocessing. The Industry Day at ETH each year attracts hundreds of visitors from academia, industry and investment organizations. 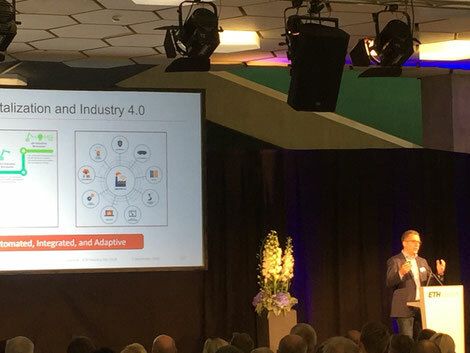 We were honored to be amongst the presenters at this event sharing our contribution to industry 4.0 for the pharmaceutical industry. Manufacturing 4.0 is becoming a key direction in the biopharmaceutical industry. At the Bioprocessing Summit in Boston two full days were dedicated to discuss the challenges and trends in this field. 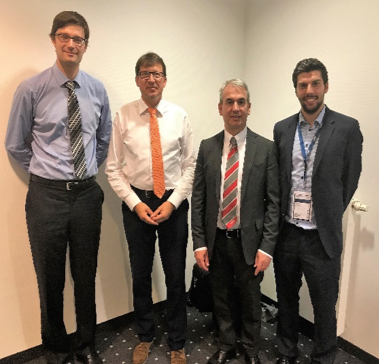 Michael was privileged to participate as a speaker, chairman and panelist, and was proud to present our vision on smart, digitalized and automated bioprocessing together with our close collaboration partner Dr. Nicolas Cruz from TU Berlin. It was a privilege to follow one of the intellectual fathers of continuous biomanufacturing, Dr. Ganapathy Subramanian, to a pleasant forum in Oxford, where leading scientists, equipment and solution vendors and end-users discussed the important trend in advancing the technical need and operational strategy for implementing continuous manufacturing in pharma industries. 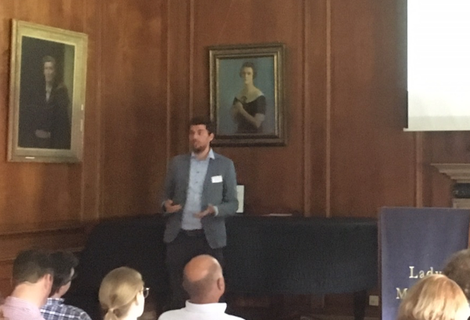 Michael highlighted in his presentation that particularly in continuous processes the role of robust quantitative tools supporting real-time understanding and decision taking are of key importance to facilitate the operation and automation of the complex plants. Achema is the world forum for chemical engineering and the process industry offering once in three years to more than 150,000 participants an innovation platform, technology summit and international networking. We were delighted to be invited to contribute to the seminar on the topic "Scale up of continuous production processes of antibodies, application fields of data analysis, their use in process modeling and generation of algorithms for the Machine learning " together with the host Lewa as well as ChromaCon and Rockwell Automation. 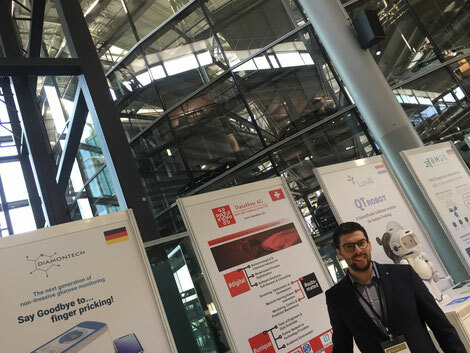 We were impressed to see the broad scope of the exhibited technologies and the important role of digitalization, advanced quantitative tools and automation. Our industry is ready to approach and master the challenges towards industry 4.0. For the first time, we organized two events at ETH Zurich centered on data analytics and digitalization for the biotechnology and pharmaceutical industries. The two-day course on Advanced Process Data Analytics was fully booked out. 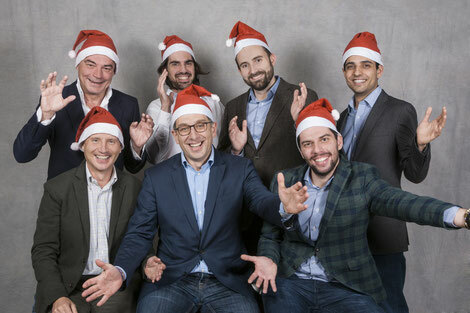 The participants enjoyed a versatile program combining lectures, hands-on case studies and socializing in Zurich. 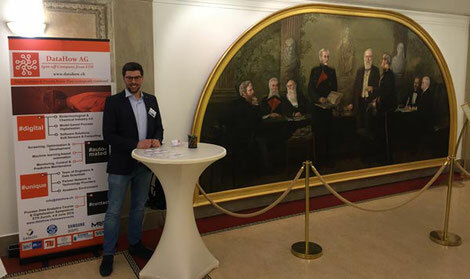 The Symposium on Big Data and Digitalization in Biotech and Pharma was attended by more than 80 professionals. 10 high-level speakers, several solution exhibitors and a poster session contributed to a versatile program. Most of the participants were from industry (73% in course, 55% in symposium), whereby 15 out of 25 the largest European pharma companies were present. A detailed video about events and the information for the 2019 events can be found here. 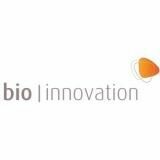 BioTalk US is a leading annual meeting which brings together some of the most influential senior executives across the world’s Pharma & Bio-pharmaceutical Manufacturing community. Alessandro highlighted the versatile role of process models to achieve manufacturing excellence in his presentation and was delighted to chair during both days of the event in Boston. We are proud to announce that our article Robust factor selection in early cell culture process development for the production of a biosimilar monoclonal antibody, published in Biotechnology Progress, was one of the most frequently downloaded papers between 2016-2017 in Biotechnology Progress. 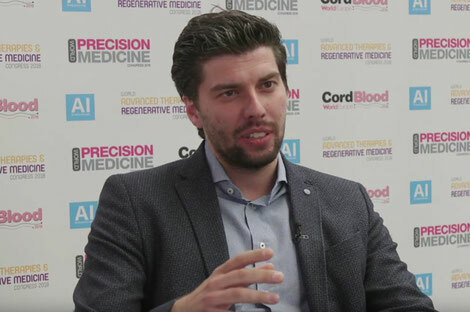 Michael was delighted to give an interview about our company’s vision at the World Advanced Therapies and Regenerative Medicine Congress in London. 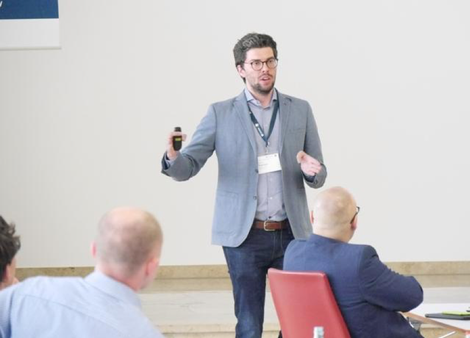 Outliers can be good or bad – it was definitely an interesting experience to pitch our company’s vision on digital bioprocessing on this year’s World Advanced Therapies and Regenerative Medicine Congress in London. Across exhibitors from diverse areas in this interdisciplinary field we were the only company to present the importance of quantitative tools for the development of the medicines of tomorrow, and enjoyed the prominent representation of our most experienced member. Big data in Bioprocessing? What makes it big and how can we benefit? 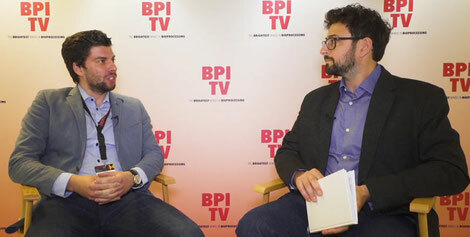 Michael gave an interview to the Bioprocess International TV team about DataHow and mastering the digitalization challenge by joint forces. The Dechema located in Frankfurt is one of the most established institutions in the German chemistry environment. 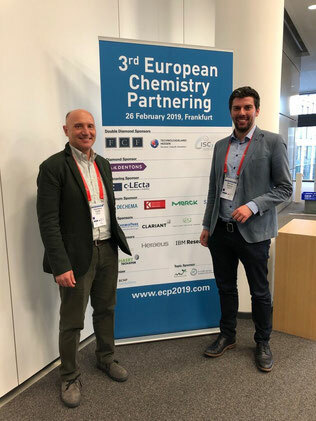 With big data analytics becoming a key topic in this sector, Michael was delighted to present our vision of hybrid process models for meeting the digitalization challenge in chemistry and pharma, which was very well received. 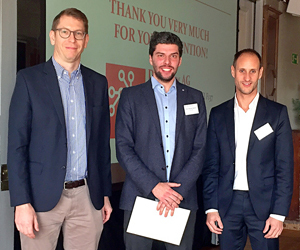 With a team of Alessandro, Fabian and Michael we participated at this year’s Bioprocess International Summit in Amsterdam with three presentations and our company stand. It was a great networking experience and a clear success for our vision of model-based process digitalization! 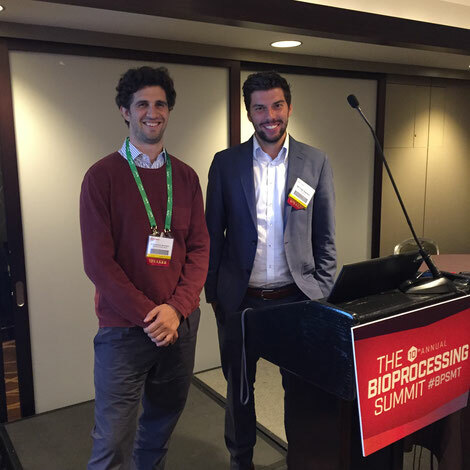 Alessandro presented our novel results on model-based continuous bioprocessing and process optimization at Bioprocessing Summit Europe and enjoyed the discussions with the other participants. Scale-up is a key challenge for efficient development and transfer to production. Biotech companies and research groups on the bi-yearly BioProScale. 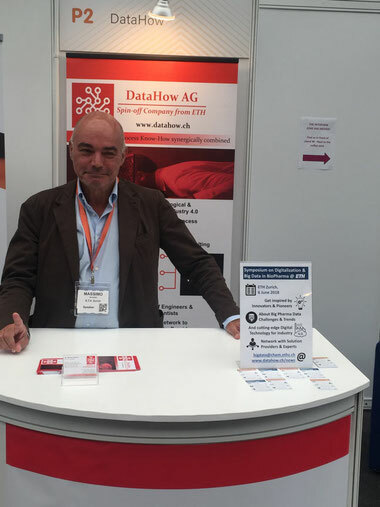 Michael presented our vision on model-based process scale-up and bioprocess digitalization and enjoyed the prominent location of the DataHow stand.